"Analysis of the rhombohedral and tetragonal symmetries coexistence in lead-free 0.94(Bi0.5Na0.5)TiO3 - 0.06 BaTiO3 ceramics from nanopowders". Advances in Applied Ceramics Structural, Functional and Bioceramics. Characterization of Nanostructured Phases and Peculiar Phase Transitions in BNBT Lead-Free Piezoceramics. 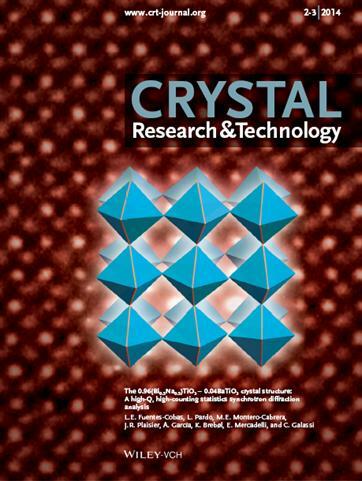 COVER PAGE in 2014 - The Year of Crystallography and X-Ray Diffraction. "The 0.96(Bi0.5Na0.5)TiO3-0.04BaTiO3 crystal structure: A high-Q, high-counting statistics synchrotron diffraction analysis" L. E. Fuentes-Cobas, L.Pardo, M. E. Montero-Cabrera, J.R.Plaisier, A.García, K. Brebøl, E. Mercadelli and C. Galassi. Researchers of CIMAV (Chihuahua, Mexico) in cooperation with Instituto de Ciencia de Materiales de Madrid (ICMM) designed and carried out a synchrotron powder diffraction experiment at Elettra Sincrotrone Triestre, especially designed to shed light on the controversial problem of the crystal structure of 0.96(Bi0.5Na0.5)TiO3-0.04BaTiO3 , which is reported in this work. The investigated material is a key component of the current international search for lead-free ferropiezoelectrics. A wide angular range diffraction pattern was measured in high resolution configuration, with emphasis on trustable counting stastistics in the high-Q interval. Cc and R3c structural models were tried as primary phases. The obtained experimental results are incompatible with the monoclinic model and clearly favor the rhombohedral symmetry. M. E. Montero-Cabrera, L. Pardo, A. García, M. E. Fuentes-Montero, M. L. Ballinas-Casarrubias and L. E. Fuentes-Cobas. The Instituto de Ciencia de Materiales de Madrid (ICMM) in collaboration with partners from Mexico have processed lead-free ceramics with high piezoelectric sensitivity at temperatures below 1300 ÂºC. This low thermal budget processing will facilitate commercialisation of the lead-free piezoelectrics. (Proposal submitted in February 2011. Selected as elegible for funding in May 2011. The Piezoinstitute AISBL (PI) emerged from the EC Network of Excellence MIND (Multifunctional & Integrated Piezoelectric Devices). PI is well a functioning non profit organisation with ongoing activities dedicated to support the integration of the fragmented European expertise and deliver innovative educational tools through postgraduate degrees combining materials, technology and device knowledge. It needs, however, to continue strengthening its visibility through increasing dissemination and building out all the existing activities within education, research and training. The new knowledge under development within PI supports the environmental, safety and health policies of EU and is designed to facilitate next generation of material technologies for autonomous monitoring systems incl. Energy Harvesters. To achieve further defragmentation, PI will increase the shared research support activities incl. the preparation of proposals, active participation in programming activities for future calls, further developing of European postgraduate degrees, offering of expertise and support of innovation within the field to European industry and in particular to SMEs. To increase its visibility and support dissemination to public and professionals, PI will organise conferences, workshops, tutorials and industrial courses. PI plans to widen the offer of industrial training, based on accredited courses within technology and modelling. Thanks to complementary expertise of its members, and history of extensive collaboration, PI has developed substantial expertise within lead-free piezoelectric materials, their processing and technology, the knowledge of which combined with the design expertise, PI will exploit to support industrial implementation of, serving the environmentally friendly innovation. The scientists with PI's international degree will have a thorough and sound grounding to support Europe's environmentally friendly processing, modelling and development of next generation technologies. In February 2004 a group of researchers of ICMM (Interdepartamental Group of Functional Ferroelectric Materials, GF2 in MIND NoE) joined up for the proposal to the European Commision, together with 10 other european laboratories, of the Network of Excellence on "Multifunctional and Integrated Piezoelectric Devices (MIND)". This proposal was favourably evaluated by the Commission services with the help of independent experts in September 2004. MIND Network of Excellence and the activities of the ICMM group took place form	March 2005 to February 2010. The main objective of MIND has been to built up a durable integration of the participant institutions by the creation of "European Institute of Piezoelectric Materials and Devices" (PIEZOINSTITUTE) . This took place in May 2008, from which date this institution can work independently of the founding institutions. CSIC became Contributing Associated Member (CAM) of the Piezoinstitute in 2008. The Piezoinstitute is a non-profit organization. The purpose of the Piezoinstitue is the research, the study and the promotion of piezoelectric materials and devices. Some members of the group have teaching experience, some have advised Master and Ph.D. Thesis in Chemistry and Physics and organize national (Reuniones Nacionales de ElectrocerÃ¡mica) or international events (COST514 Workshop, 10th International Meeting on Ferroelectricity (IMF-10), E-MRS Symposium) in the field of Electroceramics and Ferroelectrics. Sol-Gel Chemistry laboratory (glove box, Schlenk apparatus for vacuum distillation and synthesis under controlled atmospheres, rotavapor, viscosimeter). Clean room with spin-coaters and rapid thermal processor of thin films. Planetary and vibratory mills for mechanochemical activation, wide range of furnaces (electrical, microwaves, hot-pressing) for synthesis and ceramic fabrication and tape casting for thick film processing. X-ray reflectivity, X-ray diffractometry and grazing incidence X-ray diffractometry. Quantitative microscopy by computer aided analysis. Dynamic thermomechanical analysis of ceramics. Software developed and impedance analysers devoted to the piezoelectric characterization of ferroelectric ceramics from resonance measurements. A complete set of equipment and in-house made software for the measurement of dielectric, ferroelectric and pyroelectric properties of ferroelectric thin and thick films and ceramics (impedance analysers, LCR-meter, RT66A tester, non-volatile function FeRAM tester). Background: coloured image of SEM of the microstructure of a (Bi0.5Na0.5)TiO3-BaTiO3 ceramic obtained by hot-pressing and recrystallization (A. García, J.L. MillÃ¡n and L.Pardo. ICMM-CSIC(ES)-E. Mercadelli and C. Galassi ISTEC-CNR (IT)).